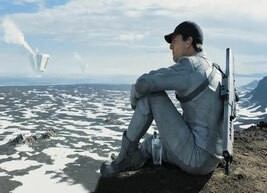 The makers of Oblivion went shopping at the Action Sci-Fi Plotline Store, grabbed a bunch of stuff off the shelf, put it in their carts and cooked up a creation that is definitely palatable but lacks imagination. 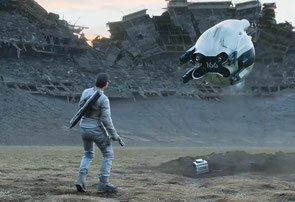 It’s actually quite an accomplishment that the film isn’t a complete mess with all of the ideas and inferences packed inside; but in the pantheon of great sci-fi, Oblivion is destined to just fade off into its title. We start on a scarred Earth in the year 2077, where we’re told that alien beings destroyed the Moon and caused climate havoc before invading. Humans used nukes to win the war, but because most of the planet is now uninhabitable, those remaining live on a space station awaiting transport to the Saturn moon of Titan to start over. Everyone except for a two-person “mop-up crew” consisting of Jack (Tom Cruise) and Victoria (Andrea Riseborough) assigned to monitor and protect huge machines sucking seawater to be used for energy for the trip to and life on Titan. This involves Jack traveling down to the surface in a phallic craft to repair machine-gun-equipped drones that protect the machines and perimeter from the Scavengers – remnants of the invading race that were mostly eradicated, but still try to cause problems. Victoria monitors Jack from their white-and-glass base high above the clouds. You’d think that their pool would be pretty cold, but that doesn’t stop them from taking a (what’s left of the) moonlight dip. Needless to say, we don’t just follow the duo in the final two weeks of their mission before joining the rest of humanity on the space station – secrets are revealed and agendas are uncovered. Especially after a human ship from 60 years prior crash lands and Jack saves Julia (Olga Kurylenko), the only remaining crewperson. To attempt to outline the twists would be a futile exercise in tedium. The real problems with Oblivion come with the pacing of all the revelations and which ones are given the benefit of significant screen time. Things are way too deliberate in the first and second acts. Anyone with any sci-fi knowledge (or who has seen the trailer) will know what the “Scavengers” really are. And who Julia will be. It just takes a while to get there and the audience is always a step ahead. Cruise himself seems to be a little bored with the goings on and doesn’t bring a high level of energy to a role that demands it. When we finally get to the good stuff and want to know more about Jack’s backstory and the details of what really happened to Earth, it is glossed over with a few lines of reassuring Moran Freeman dialogue and a flashback based on the crashed ship’s flight recorder. All leading to a final confrontation that fits, but is more than a little emotionally empty. The stakes are presumably as high as they could be, but the dramatic, attempted sentimental ending isn’t earned. Oblivion looks and sounds great in a “postcards from the end of the world” way; however, if you remove the glossy sheen the rough edges are readily apparent.